Summary: A film from the 1952 Hendon Show. The film begins with views of the film star John Blythe and his wife Nan, the Floral Queen Miss Marion Hooper, and the Mayor. Alderman Sumter, and the Mayoress. John Blythe crowns the Floral Queen. A burst of rain disrupts proceedings, but the show soon continues with a display of highland dancing, a Royal Air Force unit showing off their physical training skills, and some daredevil motorcycle stunts, with riders driving through fire and piles of wooden barrels. Elsewhere in the show there are practice parachute jumps for eager children. The Grand Floral Parade reaches its conclusion at the show, and there's film of the decorated floats for the Odeon cinema and the boy scouts. The film ends with the Mayor giving prizes for the best dressed floats. 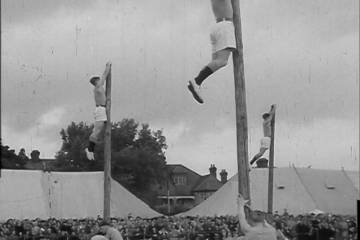 Description: A film from the 1952 Hendon Show. The film begins with views of the film star John Blythe and his wife Nan, the Floral Queen Miss Marion Hooper, and the Mayor. Alderman Sumter, and the Mayoress. John Blythe crowns the Floral Queen. A burst of rain disrupts proceedings, but the show soon continues with a display of highland dancing, a Royal Air Force unit showing off their physical training skills, and some daredevil motorcycle stunts, with riders driving through fire and piles of wooden barrels. Elsewhere in the show there are practice parachute jumps for eager children. The Grand Floral Parade reaches its conclusion at the show, and there's film of the decorated floats for the Odeon cinema and the boy scouts. The film ends with the Mayor giving prizes for the best dressed floats. Further information: This film presented to His Worship the Mayor of Hendon by the Odeon and Gaumont Theatres. An item on the 1955 Hendon Festival appeared in the Gaumont British News newsreel issued on the 7th August 1952, and this would appear to be a longer version of that story for local consumption.